Aspinwall Neighborhood Watch, the Aspinwall Shade Tree Commisssion and the Aspinwall Police Department are hosting three events on Saturday, April 27. Volunteers are needed to help. Advance sign-up for Green Streets & Mulch Madness is not required, but it will help us be better prepared. Thanks for helping us plan! Volunteers are needed to help clean the streets of Aspinwall. All supplies (vests, gloves, and garbage bags) will be provided, and this is a family friendly event. Signing up in advance is not required, but will help us to plan. Questions? Email aspinwallneighborhoodwatch@gmail.com. Volunteers are needed to help spread mulch around the street trees planted in 2016 and 2017 through the TreeVitalize grant. Additional trees will be mulched as needed, and as time and supplies allow. Mulching safeguards trees, provides adequate nutrients, and can also provide a barrier from landscaping damage due to weed-whackers and lawnmowers. Signing Questions? Email aspinwallshadetree@gmail.com. Volunteers are needed to staff the collection, which will be held on Commercial Avenue in front of the Aspinwall Police Department. This collection is in conjunction with the DEA's national program and helps to safely dispose of unwanted or expired prescription and over-the-counter medication, keeping these items out of the wrong hands and out of our water. Questions? Email aspinwallneighborhoodwatch@gmail.com. Please provide your contact information so that we can share additional details as needed. 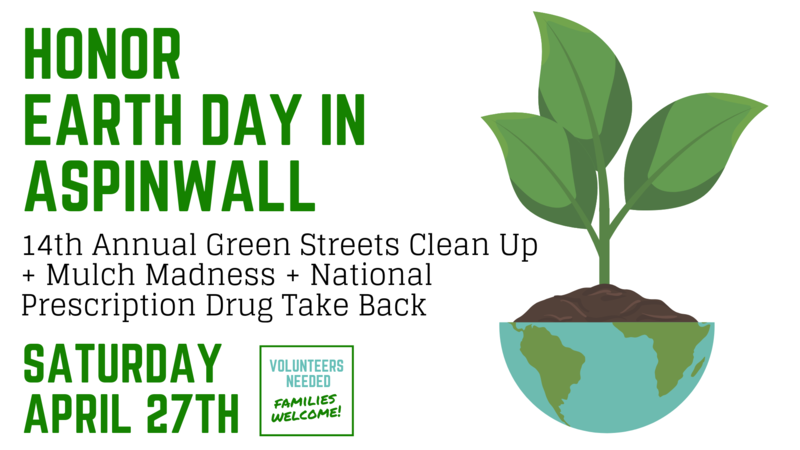 This event is rain or shine, but should severe weather force us to cancel the Green Streets Clean Up or Mulch Madness, we will send an email and also post on the Aspinwall Neighborhood Watch Facebook and Twitter accounts. Please note: the Prescription Drug Take Back will take place regardless of weather.